James is our Nazareth House Director in Sierra Leone, based in Freetown, James personally attends to every need that Nazareth House provides to the people of his country. He and his wife, Kadijah, together with his daughters Lucy and Ann Marie work tirelessly to put your donations to work for the poor. Even his 2 year old son, Roo, understands the importance of Nazareth House and how it changes the lives of so many around him. 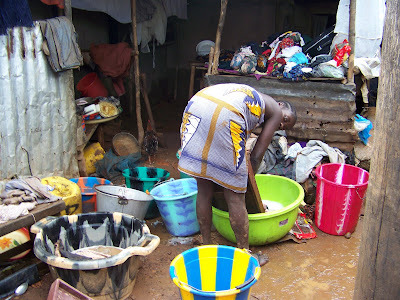 Just last week on this blog, Mama Vicki pleaded the cause for the need of a permanent home for Nazareth House to do business in Sierra Leone so we can keep the work going here. This week, I found myself (again) in the midst of more painful scenes, desperate people with less medical attention bound with nothing but open hands to see who might come to their aid. 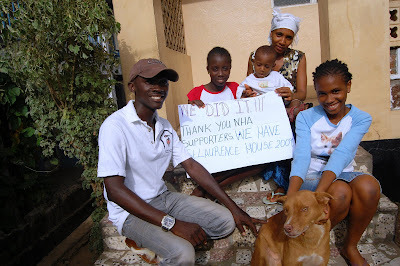 Sincerely speaking, if Nazareth House was to drop out of its present existence here in Sierra Leone, a whole lot would suffer one way or the other. Without the compound, a center of operations - the place where we keep all the supplies and medications safe for distributions, care for the sick & dying, lodging for overseas guests who come to experience work in our country, and yes, the place where my family (Nazareth House staff) can have a roof over our heads - without this, all that you are doing now will suddenly stop, put on hold. I tell you, I cannot imagine this. It would be dreadful to so many. If we do not raise the money to purchase the NHA compound by March 2010, we will be faced with this problem. In Sierra Leone today, we do have a few nice looking hospitals with less or no medication and hospital supplies. It is always not enough treatment available for those that can afford it, much less say for those who are poor and desperate. So here, we pray not to find yourself in a sudden illness or a terrible road accident. Couple of days ago, I visited a friend who was involved in a terrible road accident and was admitted at the Rokupa Community hospital. Count it true, that if you were to heal up faster, it is best that you buy your pills next door for the hospitals can’t provide all that you needed. For my friend Sorie, he was lucky to get some help with medication from us at Nazareth House but that was not all. Mohamed with the swollen eye was looking for his. Before I could blink my eyes, a whole lot of people crying with pain, all with no medication/treatment available to them as they wait in hospital. Room after room in this tiny hospital you would find someone at the point of death. Mothers with no choice but to sleep near their sick kids waiting for help that will be late or never to come. A burnt small boy praying to die because he can’t bear up the pain in his body. With your help, we at Nazareth House can help combat this in our own little way. Follow this cause and be a part of this work here with Nazareth House Apostolate. Those who are involved in Nazareth House are changing so many lives. Many times it is - no I should say MOST OF THE TIME - it is our medication and our hospital supplies and our coin -that people and the hospitals, such as you see here, depend on. Remember when we were overwhelmed with the thought of building a school for the students in Kabala? The need was great and we went about filling it. We had faith, took on the challenge and made it real. Now the school is flourishing strong and growing big with new kids everyday. This is the same hope, the same faith we got to have so we will get this compound - we can do it! We know the need and go about to fill it. I am always amazed by how we all at Nazareth House work together, even with an ocean stuck in between us - sharing, giving, loving to care for our brothers and sisters. We are family. 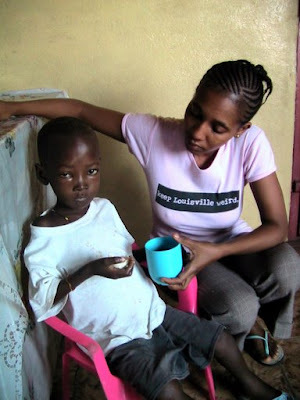 Mama Vicki needs your commitment, she ask for monthly contributions for Nazareth House. We need this, we also need you to tell the world about what we are doing, together! The good Samaratan in the Bible picked up the stranger off the road and fed him. He didn't stop there, he left provisions to care for the stranger as the Samaratan went on about his business. We all have lives, work and families (our business). Like the Samaratan, our money given to Nazareth House provides for the people of Sierra Leone while we go do our business. Give today. 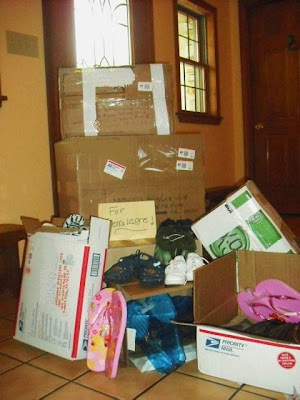 Just this week, These boxes have arrived in Pennsylvania to Maria for our 5000 Shoe-a-thon. A couple of boxes arrived from Louisville, Kentucky, and the others from Chico, CA & Milford, CT. It would be exciting to have every State in the USA represented in this adventure - even better every city! There is nothing wrong with hoping big for these kids - HOPE is not a word these children use much in their vocabularies, but we are working to change that. We're anxiously awaiting more to come... 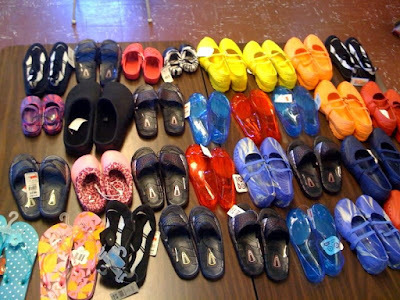 It would be so wonderful to put shoes on 5,000 children's feet! What a worthwhile project! 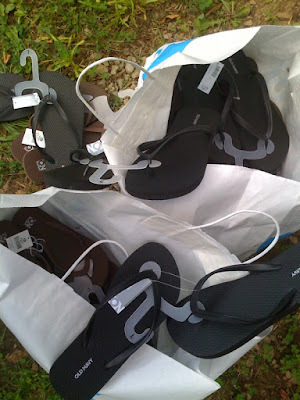 At the Nazareth House Headquarters in Louisville, KY, we received more shoes today, plus 20 flip-flops! They will all be sent to Maria next week. Keep sending the shoes, we've got lots of bare feet that travel long distances with heavy loads on rugged terrain just to survive each day! It doesn't have to be summer clogs or flip-flops, we can use sneakers, too. Maria must work at her job, she works long hours and her daughter is graduating this weekend. As soon as she gets a moment to get her breath, she'll gives us a count on the amount of shoes we have collected. Suffice it to say, we have a long way to go to reach our 5000 pair goal! Oh yes, and to Mary, congratulations on your graduation. Best wishes to you from all of us at Nazareth House. 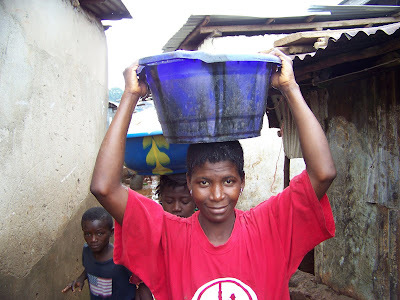 More videos from Sierra Leone coming next week. Seeing these videos make me miss Sierra Leone so much. The little child crying is because he was afraid of my white face but he calms down with a nudge from his mom and a drink. I remember having so much fun with Paul as he tried to demonstrate the heavy load this lady carries in order to sell her sweet potatoes for some food for the family. And most of these feet, have no shoes! We know you want to help us put some shoes on all these feet. 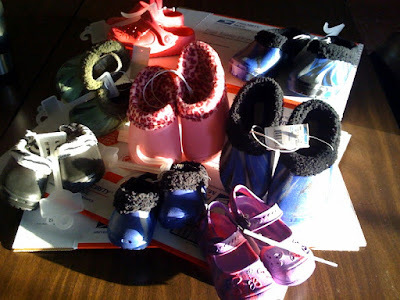 Many have already sent shoes and we are most grateful. Thank You! 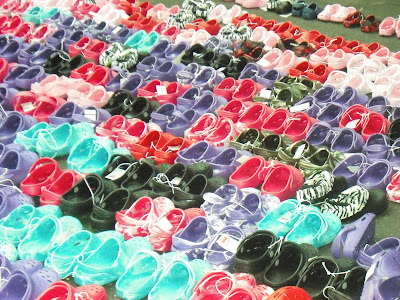 We are nowhere near our goal to put shoes on 5000 children. There are thousands more feet that are not going to be covered without our help. 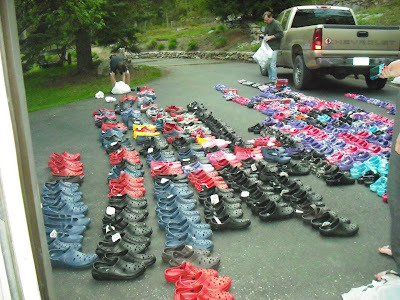 The Nazareth House/One Love Project of collecting shoes is "an happening" event! Maria is receiving shoes each day and we pray she will continue to receive them right up to the deadline of August 1, 2009. 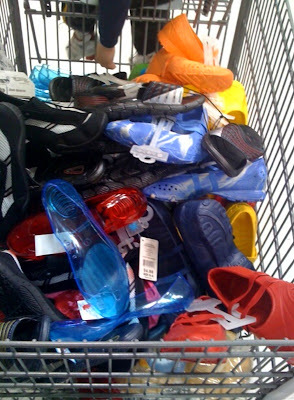 Walmart marked down a lot of lined rubber clogs to $1, maybe there is still some left in your local Walmart. If you find them, grab them up and send them on to us. 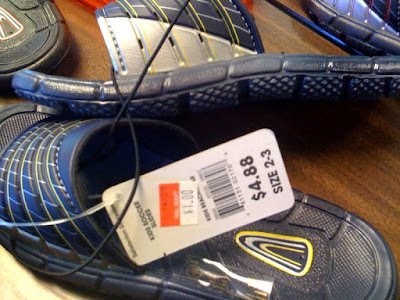 I found some sneakers for $10, and other good priced shoes at Dollar General and other discount places. Try Big Lots. Wherever you go, if you look you can find shoes at decent prices and these children are so in need of shoes. 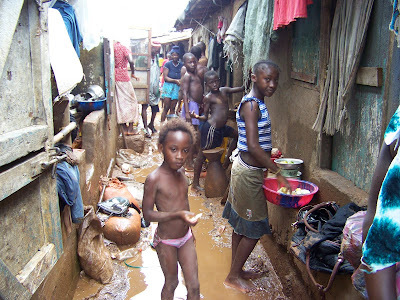 They have none and the rains are coming on in Sierra Leone. I wish we could put shoes on every child and adult in the country but this is a huge start. Let's at least shoe 5000! We can do it! If you get the shoes, we've got the feet! We've had really good luck relative to the Freetown Post up until November of 2008. Our packages were all arriving safe and sound until then, then suddenly they arrived opened or not at all. We are still running on a 89% success rate on getting all items to Sierra Leone by post, but our shipments just aren't arriving as smoothly as before. Last week another package arrived, leaving around 4 packages still out there, hoping to find their way to St. Laurence House. One contains the very crucial worm pills for the orphanage, the children are in great need of this medication. Even at his young age, Roo appreciates every box that arrives and knows it will bring help to someone. He keeps this package in a tight grip until he makes his way into St. Laurence House. You don't see such excitement in the faces of children of 1st world countries when they receive a package, open it and find it contains toddler formula or stomach medicine! Even more compelling is that Roo is aware that these items are not for him! Of course, after further investigation in the box, hidden under the hospital supplies and syringe needles for Kroo Bay, Roo finds some Summer Sausages sent for St. Laurence House enjoyment! Oh what joy to this little boy, these sausages are such a special treat - meat that doesn't need refrigeration! 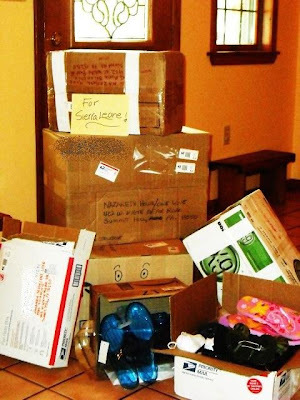 The next step is to pack up the items that are intended for Kroo Bay Medical Clinic and get it to them. Roo intently watches as his father, James, sorts the medications and hospital supplies. James and I had a lengthy discussion the other day. He is hurting so much because of the delay in receiving some of the hospital/medical supplies. Kroo Bay is in desperate need for what we have already shipped and he feels sad that the post is not cooperating to assist in helping these needy people. 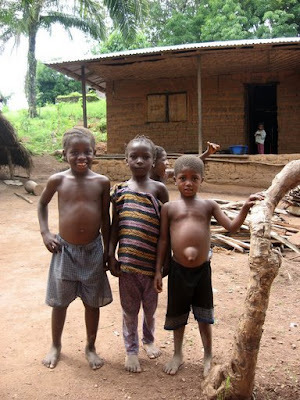 The orphanage desperately needs the worm medication. He said he feels so bad for the people that he has not been able to sleep at night. James talked with the postal workers and asked them why our boxes are being delayed (or possibly gone missing). Their reply, "Not our fault"; "must be happening in another country". I beg to differ, I can track them until they get to Lungi, (the port point of Sierra Leone, where the airport is) then its a gamble. The Post Office in Freetown has been faithful and considering their little to no pay for their work, they have been exceptional. Its my suspicion that the abuse of the packages is happening at point of arrival. If only those delaying their delivery would have as much consideration of their fellow countrymen as the people who donated the medications and other humanitarian needs. Trial and error are part of growing and Nazareth House will do all that it can to find a way to get the items needed to these people. 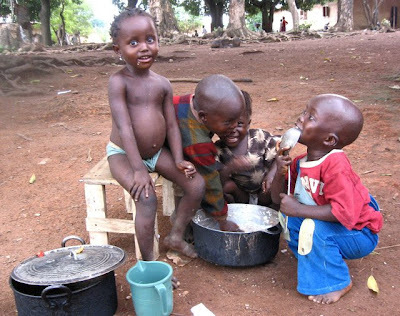 The children in the above picture and all the others in Salone, are our reason to fight and do all we can. These beautiful people have captured our hearts. Like in every society, there are those who are corrupt, but for the most part, the people of Sierra Leone are gentle, loving people who had no comprehension that another human being could be so bad as to hurt another person... until the war...and then they experienced and witnessed the most unspeakable atrocities. And yet, they continue on, struggle after struggle, re-building their lives with no anger in their heart. They make life happen in the moment, whatever that moment may hold. It is for them, that we band together and make their moments a little better, bit by bit, moment by moment. Thank you for your continued support. James is actively looking for a new compound, we must have faith and be prepared once the funds are raised and the proper property is revealed to us. depending on condition; price may be high??? On that note, James also looked at some land for building a place. This is an empty lot that he came across that is for sale. You can see one organizations' HUGE compounds being built in the background. We are not looking for anything that posh by any means. He didn't give the asking price for this land, rather, he was told about it to see what we thought...do we want to build? do we want to buy already built? Roo has completely recovered from the serious illnesses he suffered a few weeks back. He is enjoying being a healthy two year old, living and loving life! Thanks be to God! Labels: Freetown, Lazarus Sierra Leone Nazareth house death freetown salone Outreach, Seraphim Hicks. Now it is time that we come together to commit to a huge effort to make the compound (a permanent center of operations residing in the area in which we work) a reality. There is so much at stake - namely: LIVES. Owning our own land, our own building, is imperative to the continuance of our ability to maintain the level of humanitarian aid that the people of Sierra Leone have come to depend on from you as Nazareth House. If Nazareth House was to drop out of the picture, many would experience many losses in one way or another - either food, medical aid, schooling, health and/or some would lose their very existence. I, for one, am not willing to allow this to happen. I don't believe that you want this, either. 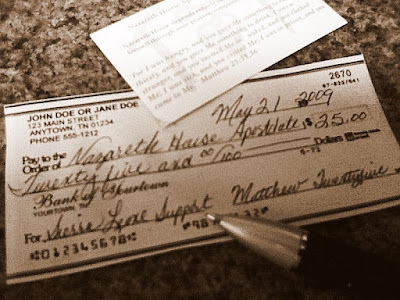 Several of you have committed to monthly contributions for Nazareth House. Regular monthly donations allow us to have dependable income to provide for those in need. However, we must enlist many more monthly contributors to continue the outreach we are currently giving each month PLUS raise money to purchase our own property. We are striving to reach 1000 people giving at least $25 per month to keep at (or above) the current level of aid, keep our Kabala School rolling & growing AND raise money for the compound. To date we have 26 current monthly contributors... a long way from 1000! 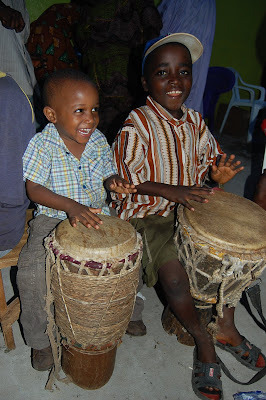 At this time we are able to make the monthly needs and the Nazareth House Kabala School budget each month but there is nothing extra to apply to the compound fund raising. In March 2009, we were able to secure our rented quarters for one more year... this ends in 2010 with NO renewal. It sounds impossible to raise such money in so little time; but I know there are many other organizations doing a lot LESS with a lot MORE money. God knows our needs. I keep hoping somewhere out there someone or some organization will have the compound money & will open their heart and give it at once. It could happen, but its not the way things usually go. We pulled together to build a school, clothe the students in uniforms, feed the hungry in many areas of Sierra Leone. We have done A LOT! and will do even more. We must pull together again, locking hearts and minds to find a way to make this happen. You, individually or with your organization make up Nazareth House-those that pray, support, and work to serve those in need. It is that unity of all our talents that make Nazareth House so unique. So how are we going to perpetuate our continuance, making a difference in the lives of those who live in the midst of despair and poverty? I saw children, unable to go to school in order to sell food to help support their families. And they aren't selling their goods in air conditioned clean buildings, they are walking (barefoot) from village to village with heavy loads on their heads. I met people who were overjoyed to receive common over the counter medications that are taken for granted in most American households. and children dying of diseases such as pin worms! Yes, pin worms! My pride, my whatever it was had to go, if begging gets them what they needed to better their lives - then begging is what I have to do. So here I am, in front of you, begging you to spread the word of the Work of Nazareth House. This is a shared process and we must allow others to be blessed as much as we have by been by this giving, this demonstration of love. This work is a part of you and you a part of it. Scroll through past posts and look at all we are doing - you, me, those in Sierra Leone ... we are making a huge difference. We cannot stop now. Of course, I am asking you to contribute financially to this worthy cause. If you haven't committed to a monthly sum, please consider doing so. If you can give anything LARGE or small, it goes to change a life. Giving once a year, quarterly, monthly...whenever...whatever...it makes a difference. Don't hold off, thinking it won't do anything...believe me it will. I am asking you to share with your friends, relatives, church, organizations the chance to be a part of this beautiful service to others. It is such a wonderful blending of people of all walks of life, denominations, religions, creeds, race coming together to help those in need. A unity of love. "for I was hungry, and you gave Me something to eat: I was thirsty, and you gave Me something to drink, I was a stranger, and you invited Me in; naked, and you clothed Me; I was sick, and you visited Me; I was in prison , and you came to Me" These are Jesus' words but they are shared and summed up by all religions - "help the poor, the hurt, the needy". If you need information or material to help spread the word about Nazareth House please email me at nha.prayer@gmail.com. You can also check Nazareth House Apostolate as a Cause on Facebook. See us in action on Youtube at www.youtube.com/SaloneNHA. If we go into the bank, we can't collect the interest on our money unless we've put money into our account. Right? Conversely, we can't collect money for a compound for NHA unless we've put interest into doing so. Lets compound the interest for NHA....spread the word, tell everybody. Deadly runaway rock in Freetown. Reports are that 2 have been killed! Environmentalists blame tragedy on erosion caused by tree felling. Apparently the boulder hit a group of children fetching water from pumps in New England Ville of Freetown. If you would like to be a part of the SHOE DRIVE for our students at Nazareth House Kabala School in Kabala, Sierra Leone and the children of St. Mary's Orphanage; Walmart is selling on clearance for $1 these rubber clog shoes. Check out your local Walmart and see if they have any left in your area. Can you imagine, you can put shoes on 20 kids for $20 bucks! Awesome! 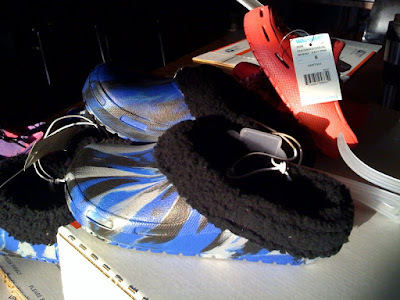 The shoes are very practical as they are rubber and will be especially good for the upcoming rainy season. Also, the lining replaces the need for socks, which most children do not have! Marie from One Love Foundation, a charity for Sierra Leone that partners with Nazareth House, is preparing a container to ship to Sierra Leone. The shoes will be distributed to our school students and the orphanage with any overage of shoes distributed to the thousands of children who have no shoes in the Sierra Leone. The Louisville area had some of these clogs on clearance in February and I thought they were soldout, but I found a few more for $1 yesterday in one of our area stores. I am sure around the country they are available as well. Oh My Gosh, Roo has typhoid & worms, too!